Amid all the changes and disruption to tourism caused by technology, who’s keeping track of the bigger picture? Brilliant destination marketers face many of the same challenges as their global colleagues, but typically work in isolation. Today’s destination marketing leaders have identified four critical trends that reflect the current disruption: Profit and Planet, Cost and Revenue, Product and Promotion, and Community and Collaboration. Today brings an opportunity to collaborate in new ways to address these issues and create a healthier tourism industry. As one of the destination marketing industry’s Leading Thinkers, William Bakker has nearly two decades of tourism experience and has helped hundreds of destination marketing organizations (DMOs) embrace change. He was a keynote speaker at Destination Think! Forum 2016 in New York City, a unique gathering of destination marketing leaders and innovators. In this interview, William shares how he has seen the industry change, some important advice for DMOs seeking to stay relevant and why he is excited for the future of destination marketing. Destination Think! : How have you seen the destination marketing industry evolve during your career? William Bakker: I started my tourism career at the beginning of the disruption of destination marketing through technology and particularly the internet. I was the first person responsible for managing Tourism British Columbia’s website, but when I left, I had a team of a couple dozen people with a substantial budget. This is a metaphor for how the digital marketing environment has changed and grown, and these changes continue today. I’ve seen a lot of change from within a DMO, but also as a result of other trends – not just in the tourism industry, but also outside the industry. I remember when Amazon started doing customization and personalization on their website, and I was thinking, “We need that!” How can we apply those kinds of trends inside the tourism world or even inside the DMO? I’ve always had these types of questions. Today, we need to examine bigger issues that the tourism industry faces, and Forum touches on those topics. For example, when we talk about Profit and Planet, we’re really going to get into mass tourism and the impact on the environment and quality of life for residents. How do we deal with those bigger issues? This is a really interesting topic for me, because it’s one thing to optimize your website and build apps and do great marketing, but another thing to really make sure that you have long-term viability on the supply side. And of course, at the DMO, it doesn’t take long before you start dealing with politics. Cost and Revenue is another area where there are a lot of questions like, “How do we maintain a stable funding model and communicate value back to our stakeholders?” Because it has been disrupted by technology and the trends of the last 15-20 years. William Bakker, Chief Strategist at Destination Think! What are some of the most urgent challenges you hear from your destination marketing colleagues today? I hear a lot of questions like, “What’s our business model?” The business model for destinations used to be pretty clear, and while the objectives don’t necessarily change today, leaders are wondering how they will structure around it and how they will organize, measure their objectives and communicate that value back. And then afterward, they’re considering what kind of structures, processes and capabilities they will need. To answer those questions, you really need to dig into those four themes. Once you understand those and how they apply to you, then you can get to the answers. The best way to organize ourselves, set priorities, let budgets flow and measure results really varies from destination to destination. Given today’s changes and challenges, how can DMOs adapt their organizations to remain relevant? Most DMOs are risk-averse, which leads to careful consideration of every detail in their activities. This doesn’t necessarily bode well in this new marketing environment, which is more about having a minimum viable product, iteration, testing and learning, making incremental steps and failing forward. These kinds of things don’t necessarily lend themselves well to a typical DMO culture. What’s the important thing to change? For DMOs, it’s the culture. A change in culture has to come from top down and from bottom-up. At the top, it’s really important that CEOs and executives help their stakeholders understand that yes, we are going to take some risks and we are going to make some mistakes, but we’re going to move forward and this really is the only way. There are tons of examples to draw from the private sector, the Googles, the Facebooks. How many times has Google launched a product that didn’t work, before they killed it? Or Apple, for that matter? But they keep moving forward. DMOs need to get their stakeholders comfortable with that approach. Then, the leaders need to model that down to their staff by giving people the right levels of authority to make those moves and feel comfortable with the fact that things are not always perfect, things are not always right, things might actually not work. This is about building on successes and learning from failures. But isn’t it more difficult for DMOs to make changes and experiment, given that they often work within the public sector? Yes, because it’s risky. How many times have you seen a newspaper article that read, “this DMO website doesn’t work,” or that pointed out a million dollar investment that didn’t get great results, or that the DMO used the wrong stock photo by accident. These issues get blown completely out of proportion. In these situations, heads are rolling at the DMO level, so you can’t blame anyone for being really careful. That’s why you need support. If you’re an executive, you need to make sure that your minister or your city government and your board and your industry stakeholders are aware of what you’re doing, that not everything is going to pay off, and that there might be negative press sometimes. What excites you the most about the future of destination marketing? Actually adding value to people’s lives in a really visible way makes me excited. This means making tourism experiences better, improving the quality of life for residents and driving economic value. Up to now, the goals have been primarily focused on driving economic value. But that’s not going to work anymore, because in the future, you need to also make sure that you find the right balance, more than ever, to maintain the quality of life for your residents, so that tourism actually adds something to your destination instead of taking away from it or bringing something undesirable. That’s why I think the future is bright for destination marketers. On the promotional side, there’s going to be continued disruption and I don’t know where it’s going to end, but it could be that from a communication perspective, the role of a DMO becomes obsolete. I’m not saying it’ll happen, but it’s a possibility. However, on the product side and on the experience side, a DMO is the only organization that can protect its brand and reputation by bringing the right people together behind a common vision, a common story and a common brand, and can then deliver on it. Individual businesses deliver on their own individual pieces. The DMO’s responsibility is to bring all the pieces together and act as a leader. What do you hope to learn from the participants at Destination Think! Forum as you collaborate and discuss the industry’s challenges? There are really smart people working at DMOs and they are all, in one form or fashion, thinking about the same things. But this usually happens in isolation. It’s almost like there are little innovation labs all around the world, hidden within the DMOs. I look forward to bringing all these DMO innovation labs together with that level of thinking in the same room to go through a process where we can put it all on the table to find some commonalities and some interesting new ideas. We can shine the light on the same problem in 18 different ways, talk about how people are dealing with it, how people are thinking about it and potentially even reach some sort of consensus or options to move forward. Instead of trying to figure it out all on their own, these innovation labs can try to do it collectively. Then, they can all go back to work and expand on the new ideas. Next year, they can do it again and keep building together. The destinations can still compete on product, experience and brand, but they will find some commonality in these really big challenges. There will be plenty to learn from each other to make a bright and secure future for destination marketing. Gain more valuable insights from speakers, panelists and participants from Destination Think! Forum, where the world’s leading destination marketers gathered to address their greatest challenges. Read more interviews with Forum’s Leading Thinkers. Can you please tell me where these tree houses are? 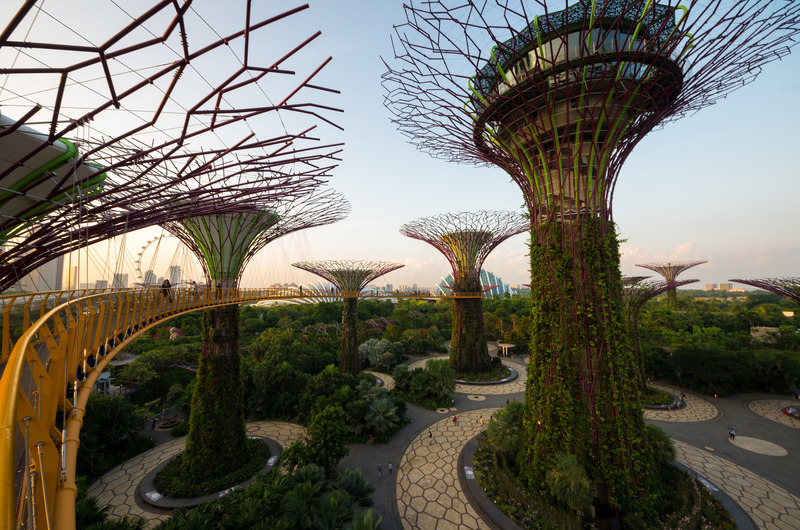 That’s Supertree Grove at Gardens by the Bay in Singapore. Hope this helps!